BLOOMINGTON, Ind. (AP) — No. 5 Michigan started fast Friday night and never let up. The Wolverines‘ defense was virtually impenetrable, the offense was balanced and they delivered the knockout punch right from the start. Ignas Brazdeikis scored 20 points, Zavier Simpson added 12 and after scoring the first 17 points of the game, Michigan pulled away for a 69-46 victory. The Wolverines (18-1, 7-1 Big Ten) aren’t just winning — they’re making it look easy. Michigan has won two straight since suffering its first loss, six straight over the Hoosiers and two in a row in Bloomington. 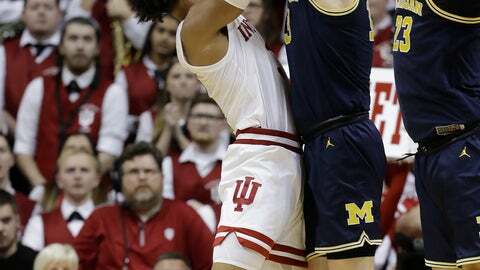 The reason: Beilein’s defense took full advantage of the struggling Hoosiers, who have lost six straight. Indiana opened the second half with four straight baskets in the lane, closing to 38-29 on Phinisee’s 3 with 16:47 left. But Michigan answered with a 12-3 spurt to make it 50-32 and the Hoosiers never got close again. Rayl died Sunday at age 77. The two-time All-American was named the Hoosiers’ MVP in 1962 and still holds the school’s single-game record with 56 points, which he did twice — in January 1962 and February 1963. Michigan: Jon Teske had 11 points and Charles Matthews had 10 points and 11 rebounds. … Simpson had five assists, giving him 299 in his career. … Beilein moved within one win of matching Johnny Orr’s school record for Big Ten victories (120). … The Wolverines had turnovers. Indiana: Shot a season-low 27.6 percent from the field while going 3 of 20 on 3s and 11 of 20 at the free-throw line. … Morgan also had four blocks and two steals while Romeo Langford had nine points and five rebounds. … Morgan, Langford and Justin Smith were the only players with more than two baskets. Indiana has scored fewer than 60 points in three of its last four games. Michigan: “We just want to stay focused, stay on the next game, do the things we can control, play together and we’ll be in a great position,” Simpson said.